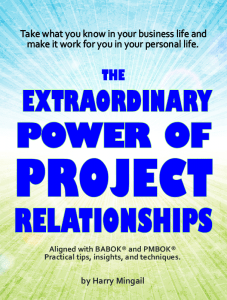 Audiobook for The Extraordinary Power of Project Relationships now available! ‘The Extraordinary Power of Project Relationships’ by Harry Mingail is packed with great ideas, techniques and many checklists to make great things happen the reader. At minimum the reader will find something and typically many things which will reward investment in this book. Great relationships will generate monetary as well as a flood of other positive differences in life. Bad business one-on-one or group relationships create stress, destruction and unproductively. Likewise, without great relationships, personal lives can be empty, boring and lonely. ‘The Extraordinary Power of Project Relationships’ (ebook and audiobook) is packed with great ideas, techniques and many useful checklists to give the reader better outcomes for projects. At minimum the reader will find something and typically many things which will reward the investment in this book, with better relationships. Great relationships will generate monetary as well as a flood of other positive differences in life. Better relationships enable happiness and success. “For more than 30 years I have provided consulting, training and education to business and non-business venues as well as universities in North America, Europe and Asia. Now I want to give back”, says an upbeat Harry Mingail. “The phrase I have coined as the motto I live by is: To give back and be given is to feel the warmth of the sun from both sides”. The book begins by taking a project (suitable for any project) self-test in the first section of the book for the reader to rate relationship abilities and confirm strengths, then focuses on the areas to improve. The first twelve chapters present key enablers for better relationships with individuals such as your customer (everyone is a customer), boss (even in one’s personal life someone takes charge depending on the initiative) and significant others. The second twelve chapters help the reader to develop better relationships with and in groups. These insights, techniques and tips apply to all manner of groups such as business project teams as well as the team of one and significant other in personal life. Also for Project Management Professional (PMP) and Certified Business Analyst Professional (CBAP), this book covers all the major interpersonal and leadership elements of the Project Management Body of Knowledge (PMBOK ©Guide) and Business Analysis Body of Knowledge (BABOK ©) and is eligible for Professional Development Units (PDU). ‘The Extraordinary Power of Project Relationships’ ebook is available at major online ebook retailers including iTunes, Amazon, Kobo, and eBookIt.com. The audiobook is currently available at eBookIt.com, iTunes and Audible.com. Harry B. Mingail (Mathematics, Bus Admin, PMP, CBAP, Six Sigma) engages, enlightens, educates and enables based upon his more than 30 years of consulting, training and education to corporate and public sector organizations as well as universities, in North America, Europe and Asia. Mr. Mingail has written four books, published many articles and has also delivered topics in video and audio formats. Harry Mingail has lectured and facilitated 100′s of webinars, workshops, mentoring and keynotes which consistently win outstanding recognitions, success and immediate practical results. Visit http://www.harrymingail.com for bookings, workshops, and more information. ‘The Extraordinary Power of Project Relationships’ ebook and audiobook are published by East Hill Productions Inc. Toronto, Ontario Canada http://www.ehproductions.com.